Sonoelastography is based on the knowledge that some diseases, such as cancer, lead to a change in tissue hardness. Elastography examines the elastic properties of tissues by applying a slight compression to the tissue and comparing an image obtained before and after this compression. Endoscopic ultrasound (EUS) is the best technique available today to diagnose small pancreatic masses and to obtain histology from such lesions. 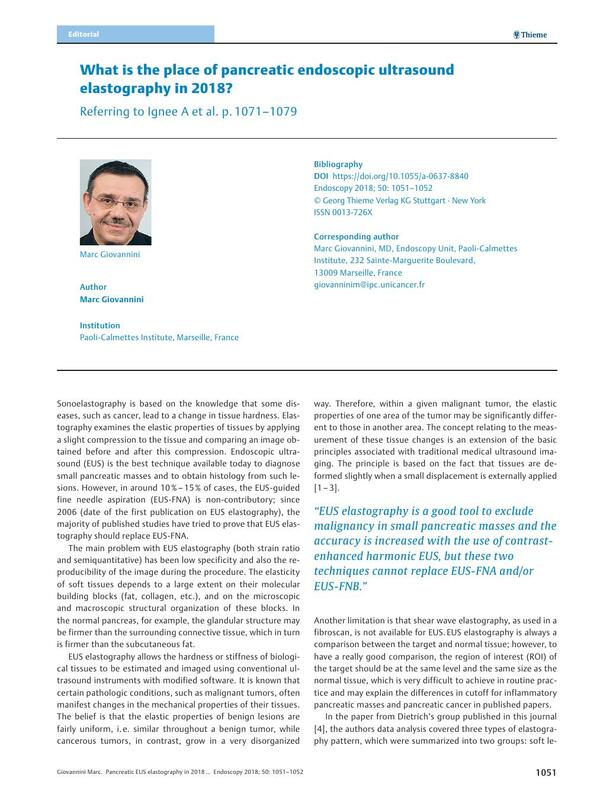 However, in around 10 % – 15 % of cases, the EUS-guided fine needle aspiration (EUS-FNA) is non-contributory; since 2006 (date of the first publication on EUS elastography), the majority of published studies have tried to prove that EUS elastography should replace EUS-FNA. The main problem with EUS elastography (both strain ratio and semiquantitative) has been low specificity and also the reproducibility of the image during the procedure. The elasticity of soft tissues depends to a large extent on their molecular building blocks (fat, collagen, etc. ), and on the microscopic and macroscopic structural organization of these blocks. In the normal pancreas, for example, the glandular structure may be firmer than the surrounding connective tissue, which in turn is firmer than the subcutaneous fat. EUS elastography allows the hardness or stiffness of biological tissues to be estimated and imaged using conventional ultrasound instruments with modified software. It is known that certain pathologic conditions, such as malignant tumors, often manifest changes in the mechanical properties of their tissues. The belief is that the elastic properties of benign lesions are fairly uniform, i. e. similar throughout a benign tumor, while cancerous tumors, in contrast, grow in a very disorganized way. Therefore, within a given malignant tumor, the elastic properties of one area of the tumor may be significantly different to those in another area. The concept relating to the measurement of these tissue changes is an extension of the basic principles associated with traditional medical ultrasound imaging. The principle is based on the fact that tissues are deformed slightly when a small displacement is externally applied   . Another limitation is that shear wave elastography, as used in a fibroscan, is not available for EUS. EUS elastography is always a comparison between the target and normal tissue; however, to have a really good comparison, the region of interest (ROI) of the target should be at the same level and the same size as the normal tissue, which is very difficult to achieve in routine practice and may explain the differences in cutoff for inflammatory pancreatic masses and pancreatic cancer in published papers. In the paper from Dietrich’s group published in this journal , the authors data analysis covered three types of elastography pattern, which were summarized into two groups: soft lesions, which were lesions less stiff than, or of similar stiffness to, the surrounding pancreatic parenchyma, and stiff lesions, which were lesions stiffer than the parenchyma. This technique is possible because the lesions evaluated in this work were small (mean diameter 11 mm) and surrounded by normal pancreatic parenchyma; however, it should be noted that the technique cannot be used for larger tumors. Their paper showed important data, giving probably the best indication for EUS elastography, which is that EUS elastography can rule out a diagnosis of malignancy in a pancreatic mass with a high negative predictive value (NPV; 96 %), this being the main interest for EUS elastography, with similar results for the evaluation of lymph nodes (NPV 91.2 % in 101 patients) having been published in 2009 . A recent meta-analysis  included 17 studies (1537 patients; 1544 lesions). The goal was to evaluate qualitative EUS elastography, EUS strain ratio elastography, contrast-enhanced EUS (CE-EUS), and EUS-FNA for pancreatic masses. The pooled sensitivity and specificity for qualitative EUS elastography were 97 % and 67 %, respectively; for strain ratio were 98 % and 62 %, respectively; for CE-EUS were 90 % and 76 %, respectively; and for EUS-FNA were 84 % and 96 %, respectively. EUS elastography is a reliable method of distinguishing solid pancreatic masses; the sensitivity and specificity for different diagnostic methods were very close. Both EUS elastography and CE-EUS can be valuable complementary methods to supplement EUS-FNA  . Today, the systematic combination of contrast-enhanced harmonic EUS (CH-EUS) and elastography have increased the accuracy of each technique and the data can be used in patients who have an inconclusive EUS-FNA. The paper by Dietrich’s group showed the same conclusions, but it would be interesting to know the results of the proposed future study with the use of CH-EUS because 50 % of the small pancreatic lesions were neuroendocrine tumors (NETs) and the diagnosis of NETs is easy with CH-EUS as they are hyperenhancing lesion. EUS elastography is however not only used for the diagnosis of malignancy in pancreatic masses. A recent paper showed that EUS elastography of the normal pancreatic parenchyma can predict the risk of a pancreatic fistula after a Whipple resection , the mean elasticity in patients with a pancreatic fistula being significantly higher than that in patients without a fistula (85.4 vs. 55.6; P < 0.001). To conclude, EUS elastography is a good tool to exclude malignancy in small pancreatic masses (as shown in the Dietrich paper), and the accuracy of elastography is increased by the use of CH-EUS, but these two techniques cannot replace EUS-FNA and/or EUS-guided fine needle biopsy (FNB). Two negative EUS-FNAs in a pancreatic lesion that is soft and enhancing can however rule out the diagnosis of pancreatic adenocarcinoma in 95 % of patients.